answer/question | Blog Abandoned, it weeps. On my way to work, if I happen to get stopped by the light at 14th and Broadway, there is this sign. 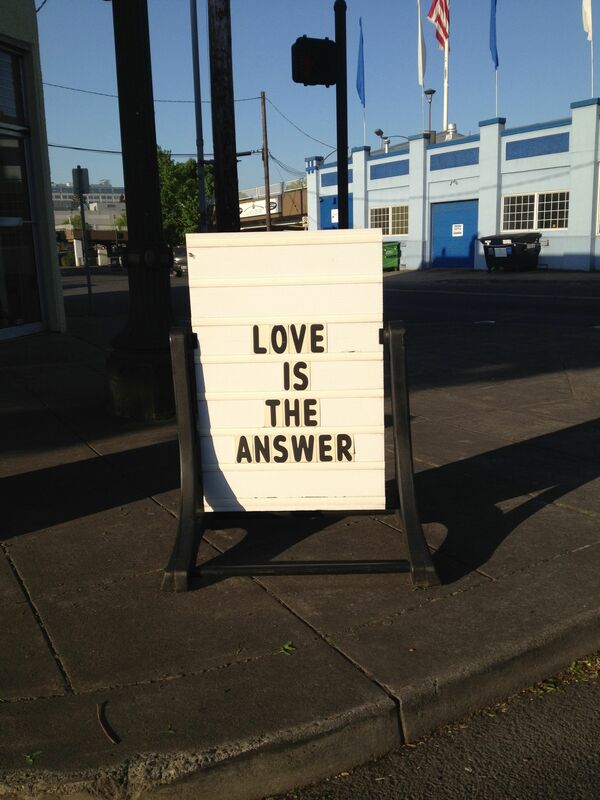 Yes, I believe that love is the answer. But to which question? Who is asking the question? And does “love” always work as an answer or does it just feel like adding, “in bed” to the end of your fortune in your cookie? Not to sound condescending or arrogant. Maybe a better sign would also have the question so that it’s clear what is meant. 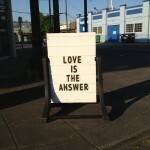 Or that if you have a question before you ask it you first have to think, is love the answer? If you truly believed that love is an answer you might rethink the question or the intent of your question. Is your question even still important? How do we end war and terrorism? How do we build a strong safe future? How do we run a company? How do we run a country? How do we, how do we, think about someone other than ourself? This entry was posted on Wednesday, May 16th, 2012 at 8:23 pmand is filed under . You can follow any responses to this entry through the RSS 2.0 feed. You can leave a response, or trackback from your own site.